When one thinks of Italian food pasta, pizza, and antipasto most readily come to mind. But Italian cuisine also includes an interesting array of soups. One such soup is the Zuppa Toscana. 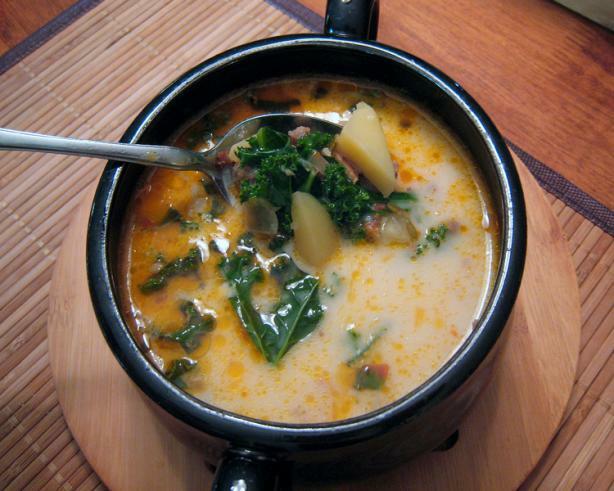 As the name suggests, Zuppa Toscana is soup indigenous to the Italian region of Tuscany. To make this soup you will need 1 package smoked sausage, 2 potatoes, cut into small slices, 3/4 cup chopped onion, 6 slices bacon, 1 1/2 teaspoons minced garlic, 2 cups kale– shredded, 2 tablespoons chicken bouillon powder, 1 quart water, and 1/3 cup heavy whipping cream. To prepare first preheat an oven to 300 degrees F, place the sausage on a baking sheet and bake for 25 minutes. Cut each in half, lengthwise. Cook the onions and bacon in a large skillet over a medium flame until the onions are translucent. Crumble to bacon and add the garlic, to the onions and cook for another minute. Add the chicken base and water, potatoes, and simmer for around 15 minutes. Add the bacon, sausage, kale, and cream and cook for a further 4 minutes. Serve when hot.